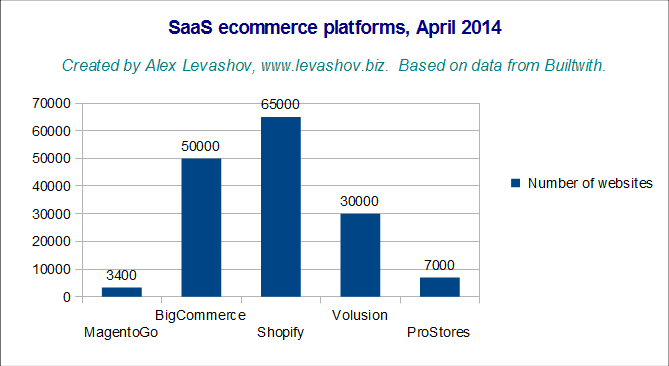 In this post I’ll try to analyse why eBay has decided to shut down SaaS version of Magento eCommerce. If you haven’t heard about that and need some advice what to do with that – check my previous post. I’ll verify is MagentoGo really a flop, what place it takes in overall portfolio of eBay products under Magento brand and what were the factors behind MagentoGo demise. So MagentoGo had been available for over 3 years when eBay announced the decision to shut it down. What MagentoGo team managed to achieve after that period of time? MagentoGo was planned as an entry point to introduce merchants to Magento ecosystem. With aggressive pricing (starting from $15/month, which is lower than competitors in general) eBay/Magento executives hoped to get significant share of the market. Let’s see what was the result at the April 2014 (data from Builtwith and rounded, so number of merchants may be different from those reported by platforms). Clearly MagentoGo is way behind all major competitors. In fact it even wasn’t in top 10 list and had less installs than another eBay owned platform ProStores (earlier product, from where merchants were encouraged to migrate to MagentoGo). Hence from the market share point of view MagentoGo wasn’t successful. Maybe, while it doesn’t meet market share expectations, MagentoGo brings eBay good money and can be a cash cow? Unfortunately I couldn’t find any publicly available information about Magento revenue, so have to do my own calculation to have at least very rough understanding. You may find reference to that calculations below. Back of napkin calculation of Magento in general and MagentoGo revenue. If my calculations are more or less correct with circa $3M annual sales revenue MagentoGo provides 10-20% of overall Magento revenue (which I estimate in $15-30M). Taking into account that according different sources eBay fired 50 people after the decision to shut down MagentoGo had been made and somebody is required to support merchants for the remaining half year, I may assume that MagentoGo development and operations were supported by well over 20% of all Magento staff (reported to be around 300 people in total). Hence we have over 20% of human resources involved in the product that brings less than 20% of revenue. Since aside of labour, running MagentoGo requires other expenses like infrastructure (hardware, bandwidth), I think that total share of expenses related with MagentoGo was even more significant. There are many examples when companies support unprofitable and even not extremely popular product if it is important for the wider business goals. Think about for example, haute couture collections developed by luxury brands. They are not profitable, but establish/confirm brand’s authority in fashion world, inspire consumers and drive sales of less expensive products. MagentoGo was designed as a first, intro step for online merchants to let them taste Magento and then move to more sophisticated products (eventually Magento Enterprise edition). It sounds very good in theory and indeed seems to be quite appealing offer for retailers who have currently limited budgets but big plans. Such merchants can significantly reduce headaches migrating from one system to another, cause they are inside the same ecosystem. 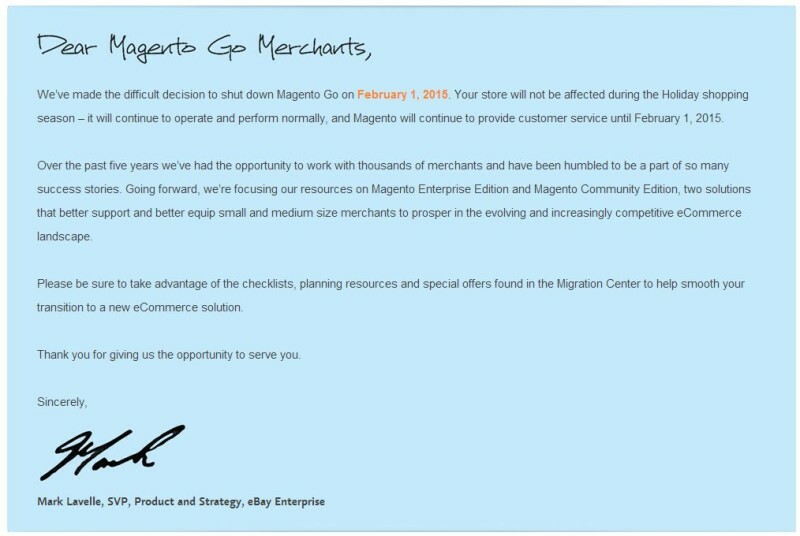 Only the problem that things didn’t work the way Magento planned: after 3 years of operations, MagentoGo even with 10,000 clients accounted only for circa 5% of total Magento merchants. So instead of funnel with huge number of MagentoGo retailers on top it is more like a bell curve, with comparatively low number of merchants sitting on Go and EE ends and mass using Magento CE. 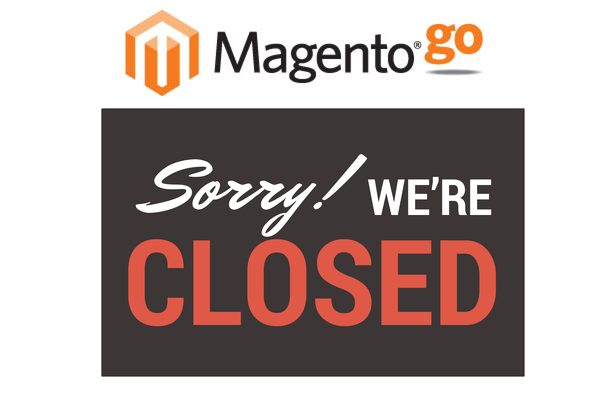 Thus MagentoGo with current number of clients and market share can’t play the planned role in Magento product matrix. Why MagentoGo hasn’t taken off? There are multiple reasons why MagentoGo didn’t take significant market share. I’ll list below several most important from my point of view. On the other hand MagentoGo has quite limited customization potential (not many extensions and themes, CSS only design tweaks), so restrains more educated merchants from deep customization of their stores. I am really interested to know how many merchants facing this problem migrated from MagentoGo to Magento CE. Disconnect with Magento brand. In e-commerce world, especially among IT people Magento is perceived as open-source system that can be installed on your own server (with all pro et contra of that way of doing business) and be owned by a merchant rather than rented. Again here in significant share MagentoGo effectively competed with Magento CE and often the choice was not in MagentoGo favour. Operational issues. Running a SaaS business is different from running product one and MagentoGo was often criticised for slow customer support, lagging performance and lack of product innovation and new features. Taking into account all these issues eBay management faced hard choice: try to fix MagentoGo (which wasn’t easy and required significant resources) or shut it done. I can only speculate, but from the departure of senior figures this year (Roy Rubin and Jimmy Duvall, who was responsible for Magento as a product) we may conclude that this decision wasn’t easy to make, however eventually eBay decided to concentrate on other products and killed MagentoGo.